Nauset Light in Eastham, MA on Cape Cod is one of New England's most iconic lighthouses. The red and white structure stands tall atop Nauset Beach and the Cape Cod National Seashore. It is well known as the logo for Cape Cod Potato Chips and also goes by Nauset Beach Light. The famous lighthouse makes for a great photography subjects at any time of the day. I recently ventured out to capture the lighthouse at night under a sky full of stars. At daylight the parking lot is filled with beach lovers and parking is a hassle; arriving at sunrise, sunset or night makes it a no-hassle activity and free. It's a short walk across the street and you can get to work right away. 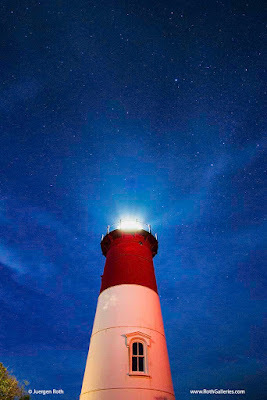 That night mostly clear sky was dominant, perfect for star and night photography of Nauset Light. I quickly set up tripod and camera gear and got to work. I used my Canon 7D with a 10-22mm lens set at f/3.5. The shutter speed was 20 seconds at ISO1600. During post -processing of the lighthouse photo I minimized noise, adjusted white balance, lighting, color saturation and contrast. Before sharpening the final image I removed dust spots, imperfection and further minimized digital noise. In recent weeks I have been exploring and chasing the light on Cape Ann, located just a short drive north of Boston. 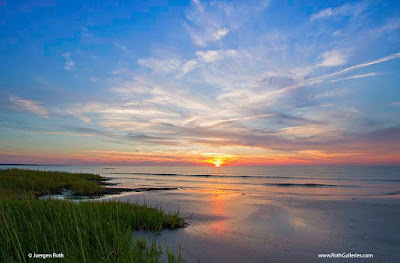 Singing Beach is one of my favorite beaches in New England as it hidden by a scenic cliff. Early morning is a great time to be at this location and make the best of a sunrise adventure. Beach crowds haven't arrived yet and the lighting is beautiful during dawn. This seascape photography image was taken only minutes before the sun peaked above the horizon. 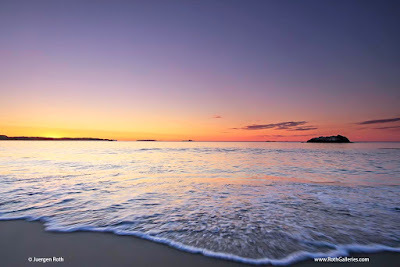 The sky was beautifully painted in orange and blue hues while the Atlantic Ocean surf gently greeted the sand. I set up tripod and gear near the incoming ocean waters while studying any obviously patterns and getting wet feet. Once I composed a pleasing composition of the sea view I waited for the right wave to hit the beach. Aperture was set to f/11 allowing an exposure time of 1/20 of a second at ISO100. A split ND filter balanced the light in the darker foreground against the brighter and colorful sky. During post processing I removed dust spots and other imperfections, adjusted lighting, contrast and color saturation before sharpening the final image of Cape Ann Harmony. Another great day - make the most out of it! 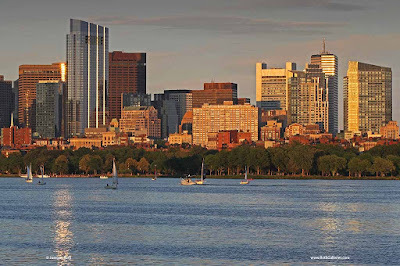 The Boston Charles River is famous for its stunning views of Beacon Hill and the Back Bay skyline. Many travel and local photographers are drawn to this hot spot in Cambridge. I am no different and I stop on Memorial Drive regularly, chasing the light for my next picture for my Boston Photos galleries. During my last Boston photo tour I arrived well before sunset and people in sailboats, kayaks, small motor boats and on paddle boats were still enjoying a beautiful summer day on the waters. I set up on memorial Drive, not far from the Massachusetts Avenue bridge, for stunning views of the familiar Boston architecture and the new Millennium Tower at downtown crossing. 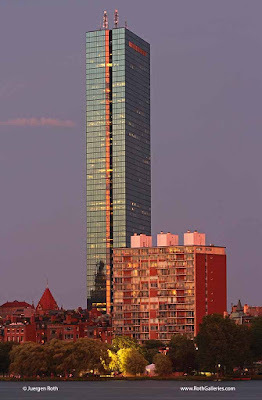 Known as Millie, the building is a newcomer in the Boston cityscape and is the third Tallest Skyscraper in Boston. I incorporated sailboats and the skyline reflections as foreground features while the main subject of the Boston skyline was struck by the last light of the day, painting the city in warm hues. Aperture was set to f/11 resulting in an exposure time of 1/50 of a second at ISO200. A hand-held split neutral density filter balanced the darker Charles River scenery and skyline against the brighter sunset sky. During post processing I followed my my routine workflow removing dust spots and imperfections, adjusting lighting, contrast and color saturation before sharpening the final Boston Charles River skyline photography image "Charles River Sailboats with Boston Millennium Tower". Subscribe to my email newsletter or follow my photo blog to stay current on my Boston Photography Adventures. Wellesley College is a close by photo destination that provides plenty of Inspiration. Water lilies are currently blooming and I was able to stop by the other day to photograph some of them. In this particular one I zoomed in close to show the entire beauty of the water lily blossom. 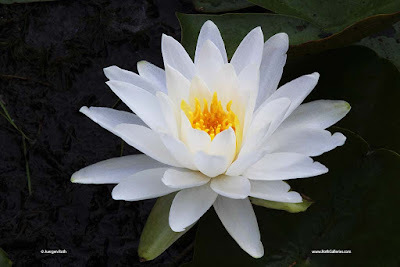 I isolated the white floral against the dark waters and leaves of the pond so to point all focus to the flower. A Polarizing Filter eliminated unwanted glare from surfaces and enhance colors. Aperture was set at f/32 to maximize Depth of Field, providing a shutter speed of 1/3 of a second at ISO100. During post processing I removed dust spots and imperfections, adjusted lighting, contrast and color saturation before sharpening the final image of I Wish I Were You. Subscribe to my email newsletter or follow my photo blog to stay current on my Flower Photography Adventures. What is the tallest Skyscraper in Boston? The John Hancock Tower is the tallest skyscraper in Boston at 790 feet and 60 floors. The tower was recently renamed to 200 Clarendon. It is also known as the Plywood Palace or John Hancock Building. This jewel of modern architecture is best photographed from Memorial Drive or the parking garage at the Museum of Science. In both locations one can create beautiful reflections of the tower in the Charles River. I like to capture the tallest building with the second tallest skyscraper in Boston. 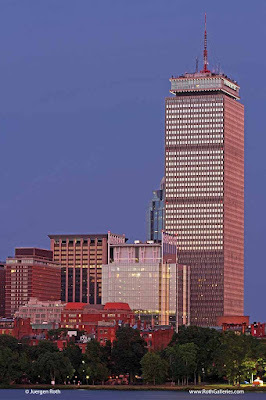 The Pru is the second largest building in Boston at 750 feet tall and 52 floors. I really like the facades of this 1968 constructed building and how it towers over Back Bay. As 200 Clarendon, the Boston Prudential Center is best photographed from the Cambridge side of the Charles River and the parking garage of the Museum of Science. The Millennium Tower in Boston was recently constructed at downtown crossing and reaches 690 feet into the sky across 60 floors. 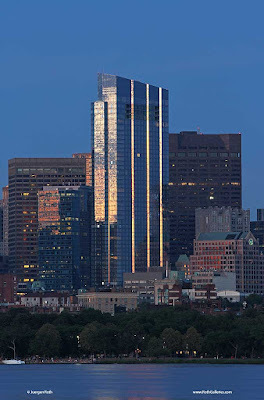 This modern skyscraper is also know now as Millie and it blends beautifully in the existing Boston skyline. I am still exploring the best locations to photograph this new architectural gem but Memorial Drive is definitely on that list. Subscribe to my email newsletter or follow my photo blog to stay current on my Boston Photo Adventures.